Each year GLSPS does a "garage raising" to raise funds for the society treasury. Guided by our professional carpenter Tom Brueshaber, a group of Society members work for a day or weekend on a construction project. It has nothing to do with shipwrecks, but it turns out to be a fairly quick, fun, and educational thing for us to do to raise money for the Society. It is kind of like the traditional "barn raising" people used to do years ago. It works out well for both the owner of the property and the Society. 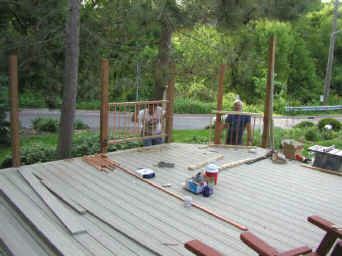 To date we have built two garages, one deck, and done the tear-off for two roofing jobs. 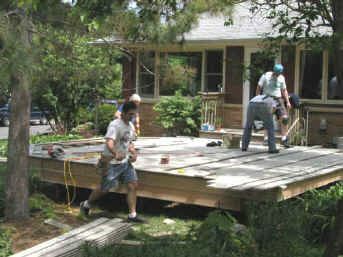 Below are a few photographs of our work. 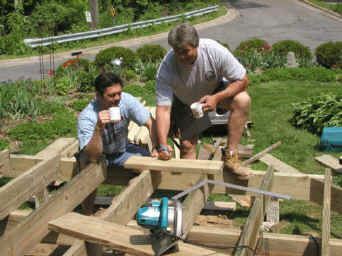 Tom and Ron Plan the details of the project over a cup of coffee. Tom Nails the deck framework. The deck cap is added. 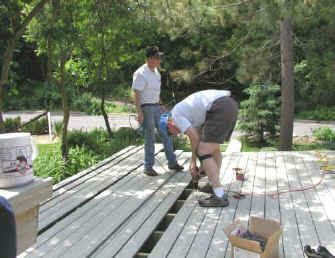 Bob Nelson and Paul Imsland fasten the decking. 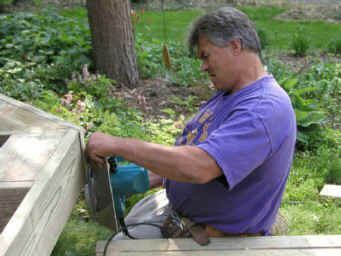 Handrails are added as the deck nears completion.